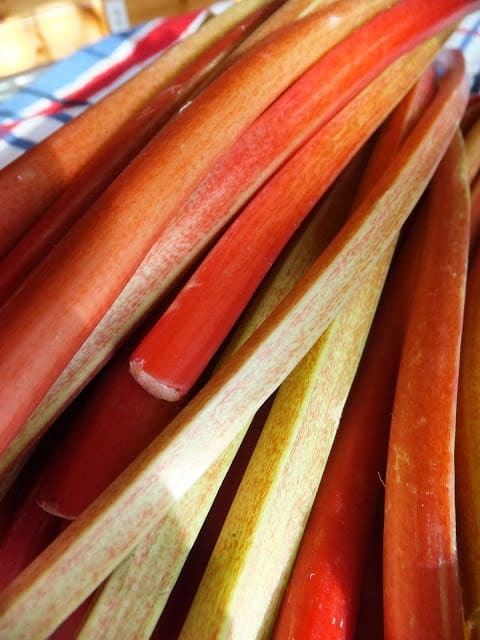 Rhubarb is the thick, celerylike stalks of the buckwheat family. Stalks can reach up two feet long. The stalks are the only edible portion of the plant. The leaves contain oxalic acid therefore can be toxic. Rhubarb is generally eaten as a fruit but is botanically a vegetable. Choose crisp stalks that have a bright color. The leaves should be blemish free and fresh looking. Rhubarb can be used fresh or frozen. 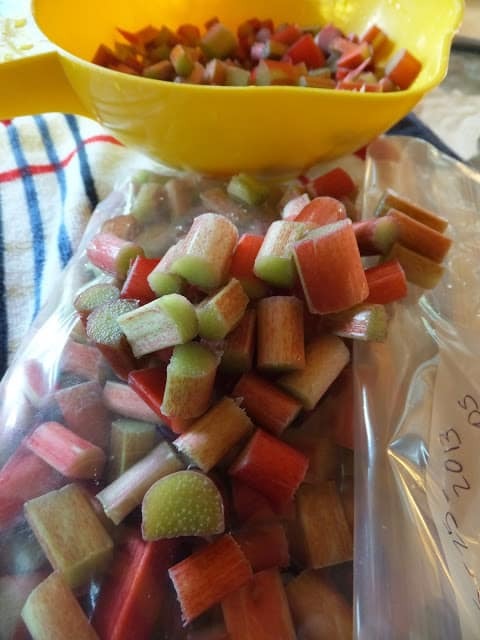 Frozen rhubarb doesn’t need to be thawed before using in a recipe. When I was growing up, we had a huge rhubarb patch in the far corner of our back yard. Each spring, my younger sister Joan and I would wait until the rhubarb had huge, green leaves and almost as tall as we were. When the rhubarb was ready, my mom would yell, It’s Rhubarb Time! My sister and I would run to the rhubarb patch and pull out as many stalks as we could carry. We would then rinse the stalks under running water from the garden hose. My mom would be in the kitchen, waiting with small bowls full of sugar. One for each of us. 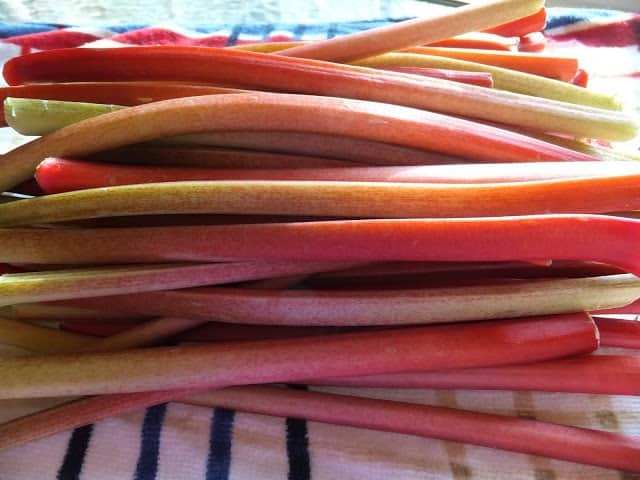 Joan and I would sit on the front porch and dip our stalks of rhubarb into our bowls of sugar. We’d be sitting on the front porch steps, giggling and listening to the robins chirp. We would sit and eat rhubarb until we got a stomachache! For dessert that night, more rhubarb would be on the menu but in the form of pie. Breakfast in the morning, would be stewed rhubarb sauce served over toast. Ahh, the good old days. Wash rhubarb and pat dry with paper towels. 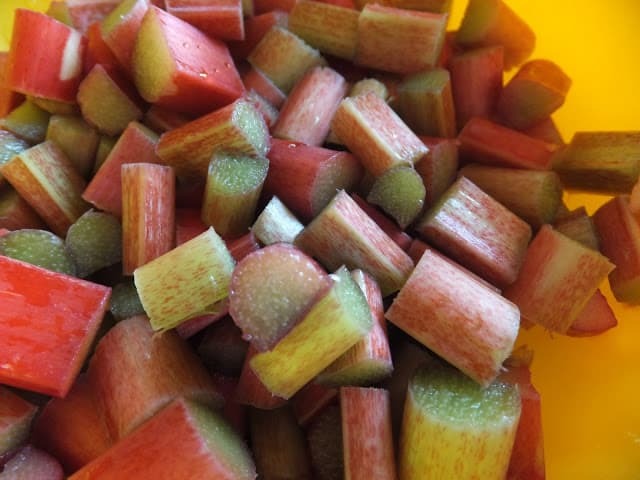 Slice rhubarb into bite-size slices/cubes. Place in freezer bags, with 2 to 4 cups per bag. Write the date and amount on the bag. Favorite French Toast is a favorite breakfast or dinner option your family will ask for over and over again! Hi Lynn! Rhubard is something I am not familiar with. I am curious how it tastes. It must be tart for your girls to dip it in sugar. Thanks for coming by my place today! Oh Lynn, I remember doing that growing up too. Even the one time taking a bite and having probably the scrunchiest face going from it being so sour. Never forgot the sugar after that I am sure.